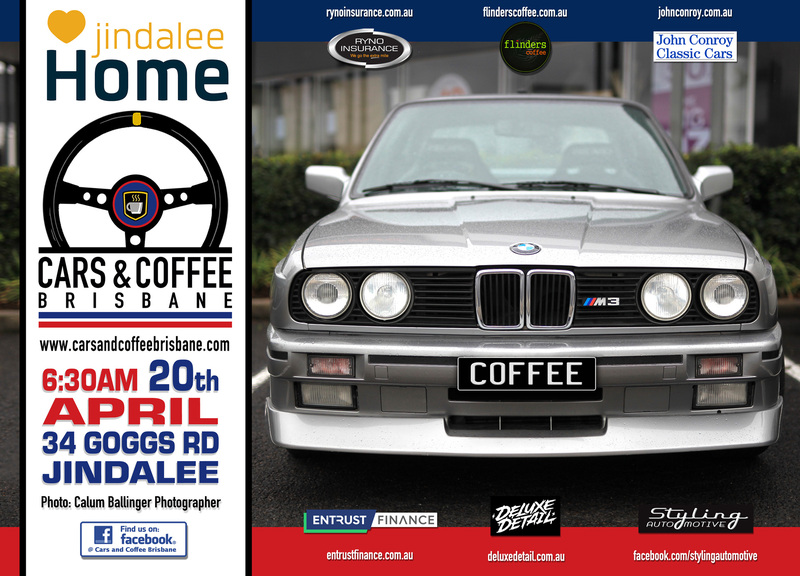 Our next Cars and Coffee Brisbane event is at Jindalee Home on Easter Saturday the 20th of April. Please join us in your pride and joy. We are looking for sponsors for this event, so please contact us for further information if your company would like to be involved. We are also seeking a new food truck. 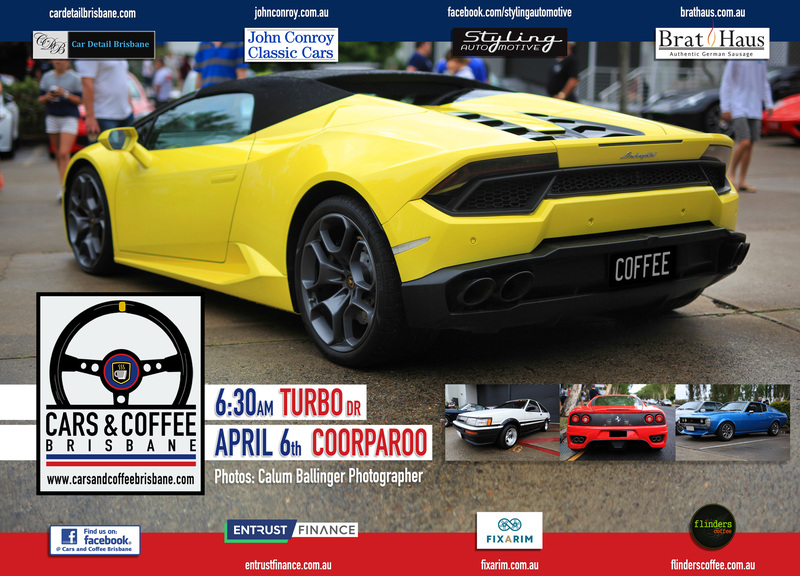 You are invited to attend the next Cars and Coffee Brisbane event at Coorparoo on the 6th of April. We would like to thank our ongoing sponsors Entrust Finance, Car Detail Brisbane, The Bratmobile, Styling Automotive, Flinders Coffee, Fixarim & John Conroy Classic Cars. If your company would like to sponsor C&C in 2019, please message us. ****If you park in the following properties you will be towed away. The Bone Clinic at 26 Turbo Drive, The Florist at 54 Turbo Drive, Theatre & Dance at 21 Castlemaine St, Fort Knox Storage at 1/8 Castlemaine St or Model Consultants Int 17 Castlemaine St**** Please show our neighbours the respect they deserve. The rain kept a few away at Cars and Coffee Coorparoo on the weekend. Thanks to everyone who attended. Please remember these events are on regardless of weather. The next event is at Jindalee Home on Saturday the 16th of March. We are looking for sponsors for this event, so please contact us for further information if your company would like to be involved. We are also seeking a new food truck & charity organisation. 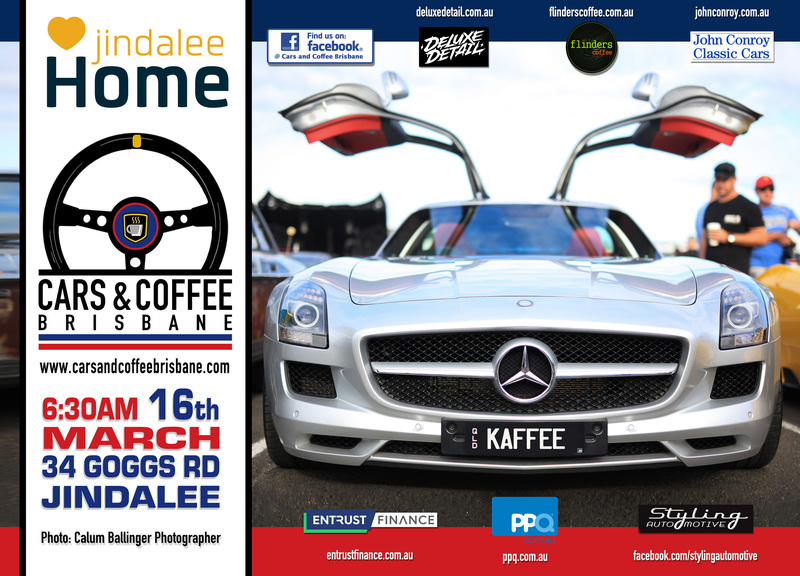 Please join us at Cars and Coffee Brisbane’s next event at Coorparoo on the 2nd of March. 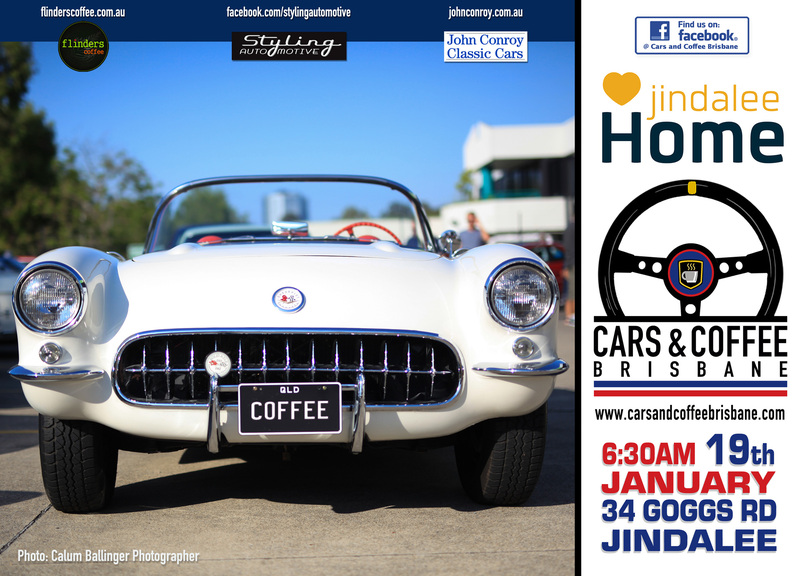 Our next Cars and Coffee Brisbane event is at Jindalee Home on Saturday the 16th of February. Please join us. 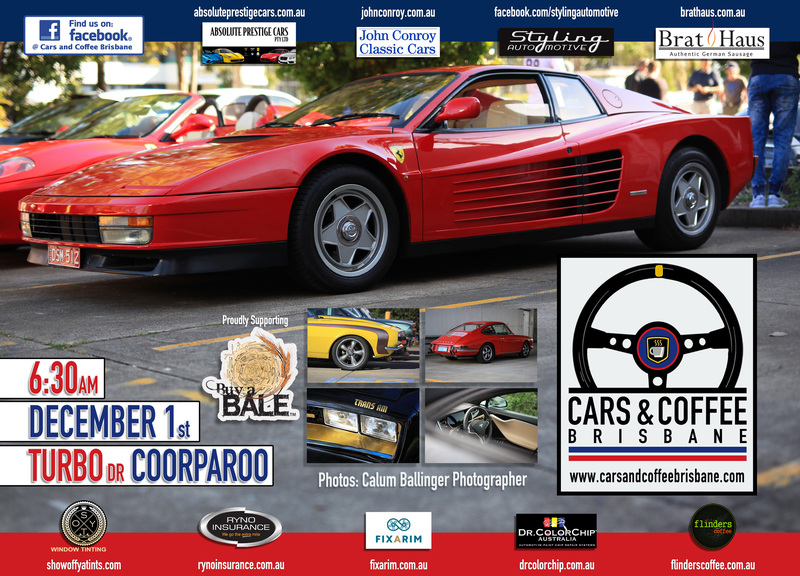 You are invited to attend Cars and Coffee Brisbane‘s next event at Coorparoo on the 2nd of February. We would like to thank our ongoing sponsors The Bratmobile, Styling Automotive, Flinders Coffee, Absolute Prestige Cars PTY LTD, Fixarim& John Conroy Classic Cars. We also welcome Car Detail Brisbane. Conversely we farewell Show off ya Tints after many years of support. 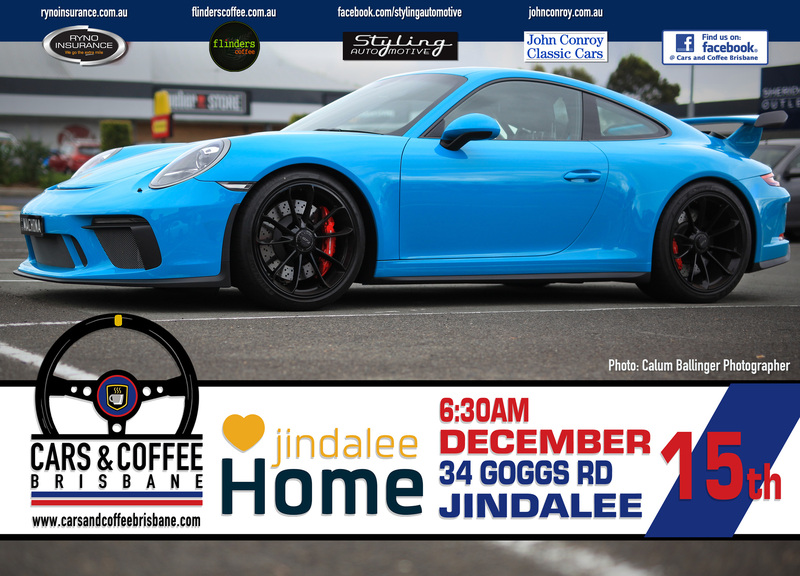 The next Cars and Coffee Brisbane event for 2019 will be held at Jindalee Home on Saturday the 19th of January. We hope to see you all there in your classics. We kick off 2019 at Coorparoo on the 5th of January. Please join us for Cars and Coffee Brisbane if you are in town. We would like to thank our ongoing sponsors Styling Automotive, Flinders Coffee, Ryno Insurance Services Pty Ltd, Absolute Prestige Cars PTY LTD, Fixarim, John Conroy Classic Cars, The Bratmobile & Show off ya Tints. Sadly we farewell Dr ColorChip Australia. Thanks for your support guys. Hopefully we will have a new charity for February. Come and enjoy the first morning of summer at the next Cars & Coffee Brisbane event at Coorparoo on the 1st of December. We would like to thank our ongoing sponsors Flinders Coffee, Ryno Insurance Services Pty Ltd, Absolute Prestige Cars PTY LTD, Fixarim, John Conroy Classic Cars, Dr ColorChip Australia, The Bratmobile, Styling Automotive & Show off ya Tints. Sadly we farewell Motorline BMW & Motorline MINI Garage after many years of ongoing support. If your company would like to sponsor C&C, please message us. Our charity is Buy a Bale of Hay – Making a difference to Australian Farming Families There will be collection tins on the tables at the Flinders Coffee vans. Please support them in their time of need.